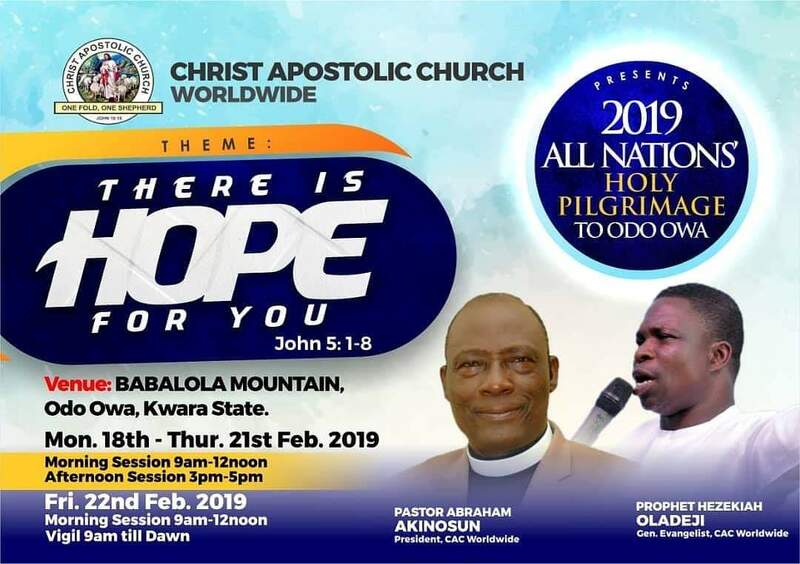 Home / FrontPage / News / CAC Worldwide unveils plans for 2019 "All Nations' Holy Pilgrimage to Odo Owa"
CAC Worldwide unveils plans for 2019 "All Nations' Holy Pilgrimage to Odo Owa"
The Authority of Christ Apostolic Church Worldwide has unveiled plans for 2019 edition of the annual "All Nations' Holy Pilgrimage to Odo Owa" programme. "All Nations' Holy Pilgrimage to Odo Owa" is an annual spiritual fiesta packaged physically and spiritually for soul winning, deliverance, breakthrough prayers, divine healing, encounter with the Holy Spirit and lot more. The programme has had participants from across the globe. CAC NEWS learnt that this year's edition will hold from Monday February 18 to Friday February 22, 2019 with the theme "There is Still Hope For You." The programme has morning (9am-12noon) and afternoon (3pm-5pm) sessions from Monday 18th to Thursday 21st, 2019. Also, the grand finale which is on Friday February 22nd 2019 has morning (9am-12noon) and vigil (9pm till dawn) sessions. It will hold at Babalola Mountain, Odo Owa, Kwara state. General Evangelist of Christ Apostolic Church Worldwide, Prophet Hezekiah O. Oladeji and other anointed ministers of God are expected to minister at the programme.